1913 Stutz Series B Bearcat. 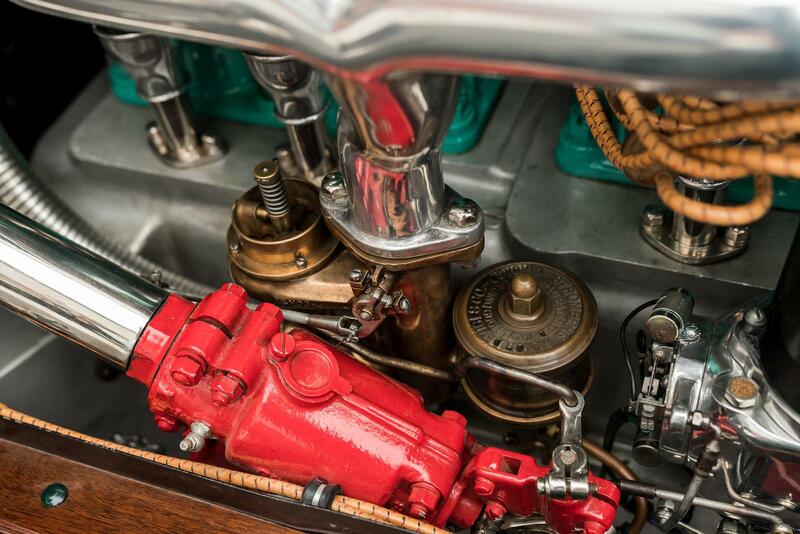 Photos courtesy Bonhams Auctions. 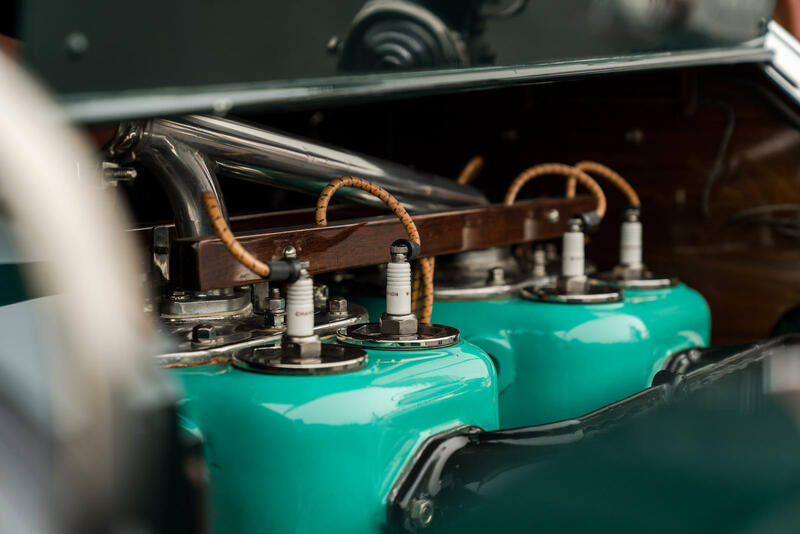 In 1911, the Ideal Motor Car Company — renamed Stutz in 1912 — demonstrated the durability of its products by finishing 11th in the inaugural Indianapolis 500-Mile Sweepstakes Race, without a single mechanical adjustment. This performance coined a slogan, “The car that made good in a day,” but sometimes perfection takes a bit longer than 24 hours. 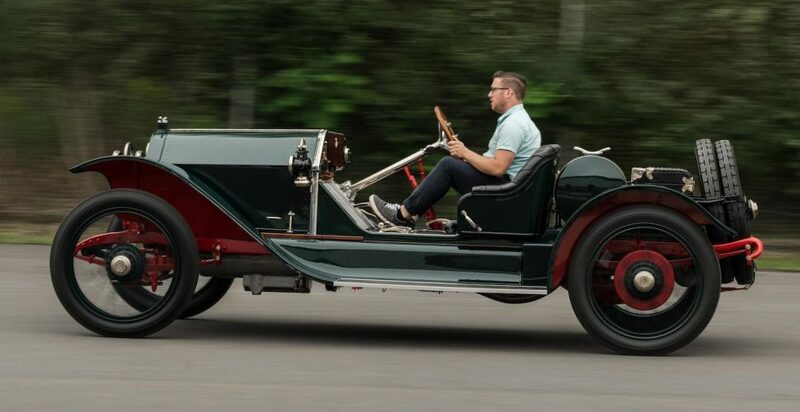 In the case of a 1913 Stutz Series B Bearcat, set to cross the auction block on Monday, October 8, as part of the Bonhams Simeone Foundation Automotive Museum sale in Philadelphia, Pennsylvania, “making good” took four decades and two dedicated owners. The Stutz Bearcat — then spelled with two words, Bear Cat — debuted in 1912, essentially a racing car for the road. To save weight and lower the center of gravity, bodywork was minimal, consisting of a hood, fenders, and running boards, and the two occupants (cradled in bucket seats) rode without benefit of protection from the elements. 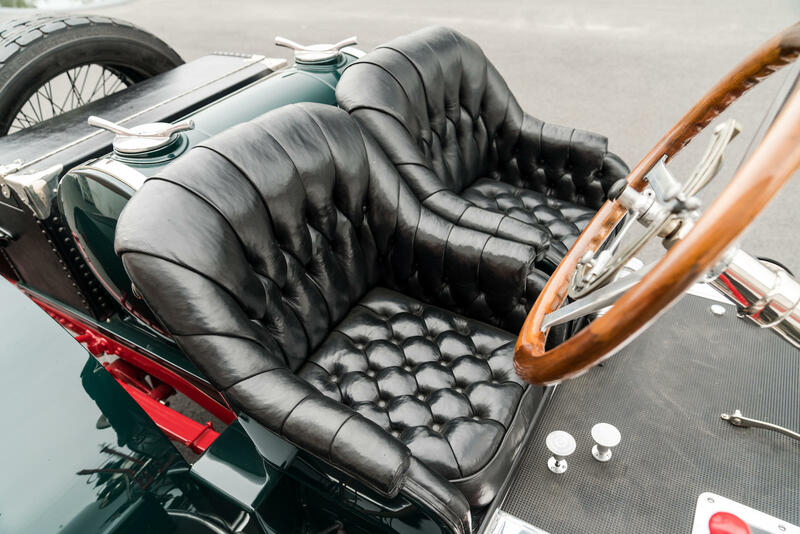 Not only did the car lack provisions for a top, it was also delivered sans windscreen, though owners typically fitted a monocle-style round windscreen in front of the driver to offer some protection from bugs and rocks. Officially, the Bearcat was built with a 120-inch wheelbase, though early examples reportedly measured 118 inches from axle center to axle center. Power came from a 390-cu.in. Wisconsin T-head four-cylinder engine, producing “over 60” brake horsepower but rated at 36.1 hp. 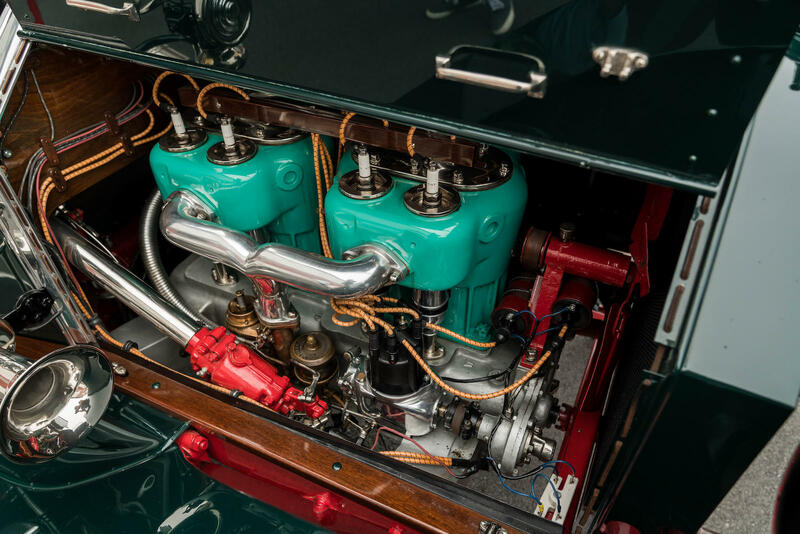 Instead of employing a conventional transmission mated to the engine, the Bearcat — and other Stutz models — used a three-speed transaxle assembly developed by Harry Stutz. 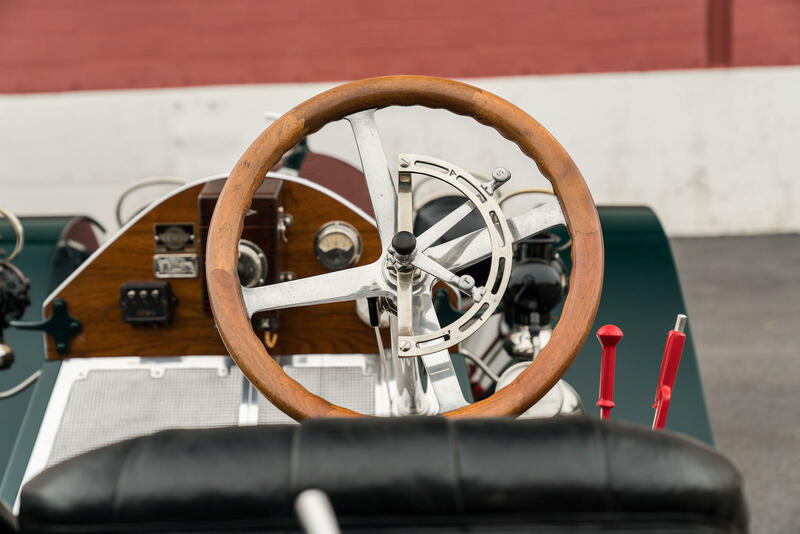 This innovation led to the founding of the Stutz Auto Parts Company, which preceded Stutz’s efforts as an automaker by a year or so. In fact, had demand for the Stutz Rear System been more robust among early automakers, Stutz may never have taken to building his own automobiles. 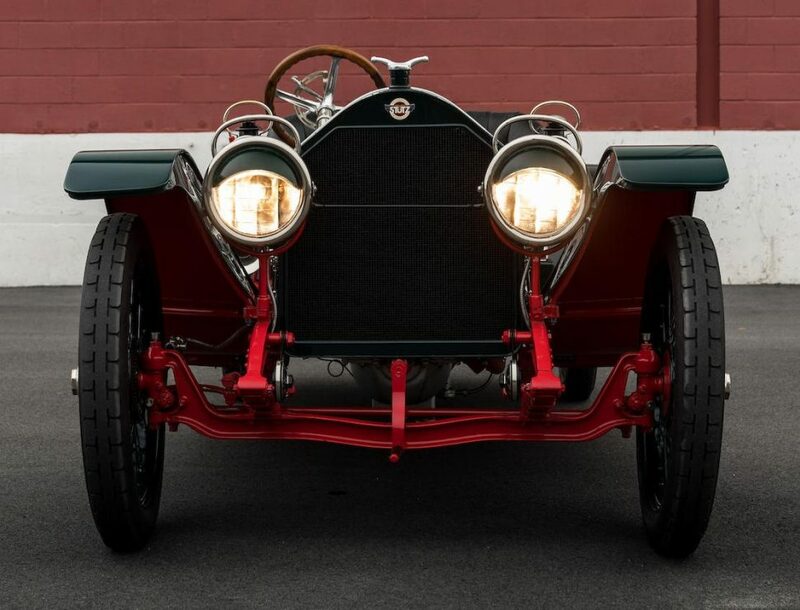 The Stutz Bearcat quickly earned a reputation for performance and reliability, winning an impressive 25 of 30 races entered in 1912. In October of that year, Stutz released the Series B line of cars, which included improvements such as an Esterline electric generator and a storage battery for the car’s lighting, an Eisemann magneto (used on most models, including the Bearcat), and a stronger transaxle assembly, with a larger-diameter case, larger gears and stouter bearings. 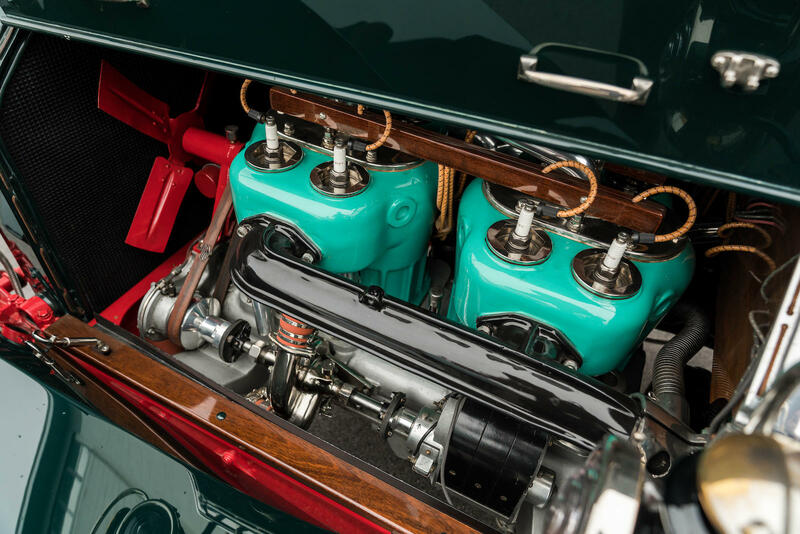 The Stutz Series B also marked the debut of an optional inline six-cylinder Wisconsin T-head engine (for torpedo roadster and touring car models built atop the 124- and 130-inch-wheelbase chassis), but the added weight offset any performance gains, and this option was eliminated after three years. Counting all models, just 561 Series B automobiles were built before Stutz transitioned to the Series E in late 1913. The early history of chassis 997, the car to be sold in Philadelphia, remains a mystery. It was first spotted on a Montana ranch by a pilot (and classic car enthusiast) flying aerial photographic surveys in the 1970s. Analysis of his aerial photos revealed that the then-mystery car warranted a closer look, and an in-person visit to the ranch proved his suspicion — the car in question was an early Stutz Bearcat. Or, perhaps more accurately, what once was a Stutz Bearcat. Time and weather had not been kind to the car, and all that remained was said to be the majority of the frame, the gas tank, and much of the Wisconsin four-cylinder engine. Despite the car’s condition, the pilot negotiated a deal to buy the Stutz, kicking off what’s best described as an epic restoration. Spares and replacement parts for the Stutz Bearcat were never abundant, but the car’s new owner did manage to locate original transaxle halves (though the center housing is a modern reproduction), front axles, trunk, steering column, and headlamps. 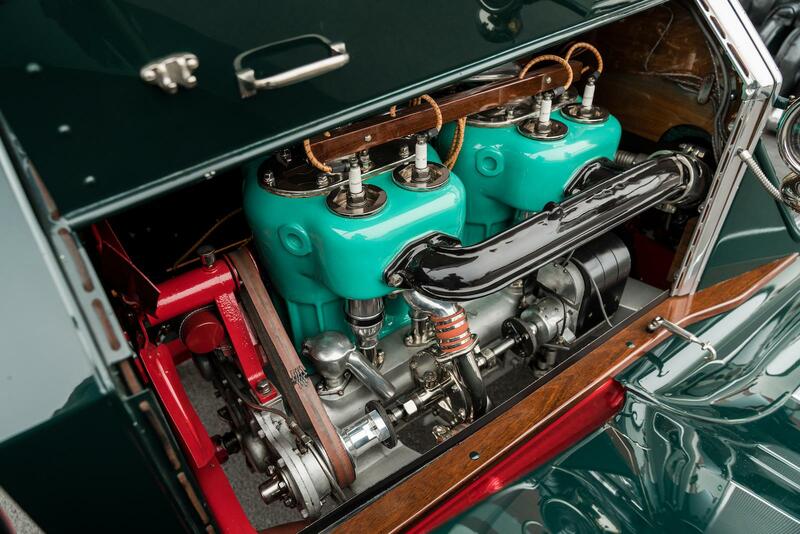 Aside from the lower block, the engine proved to be damaged beyond repair, but new cylinder blocks and internals were sourced from the Los Angeles County Museum and the Harrah’s collection. Eventually, progress on the restoration stalled, and in 2004 the unfinished Bearcat was spotted in a restoration shop by its soon-to-be next owner. 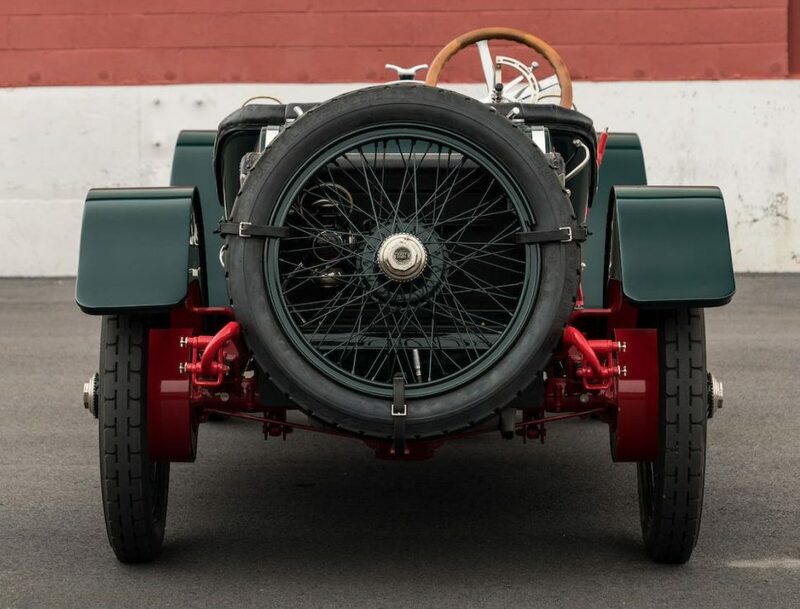 A deal was struck to buy the car, and its new owner — described as a “knowledgeable and studious collector” — began what would become a nine-year restoration, carrying out the bulk of the work on his own. Whenever possible, original components were sourced or rebuilt, but in several cases — such as the car’s bodywork — new parts had to be fabricated. A few modern upgrades were made in the name of practicality, as the Bearcat’s owner intended it to be a driver and not a museum specimen. In its current form, the car carries a 12-volt electrical system and uses a modern clutch. Chassis 997 sold at auction to the consignor for a fee-inclusive $557,500 in 2015, and this time around, Bonhams is predicting a selling price between $550,000 and $650,000 when the Bearcat crosses the block. 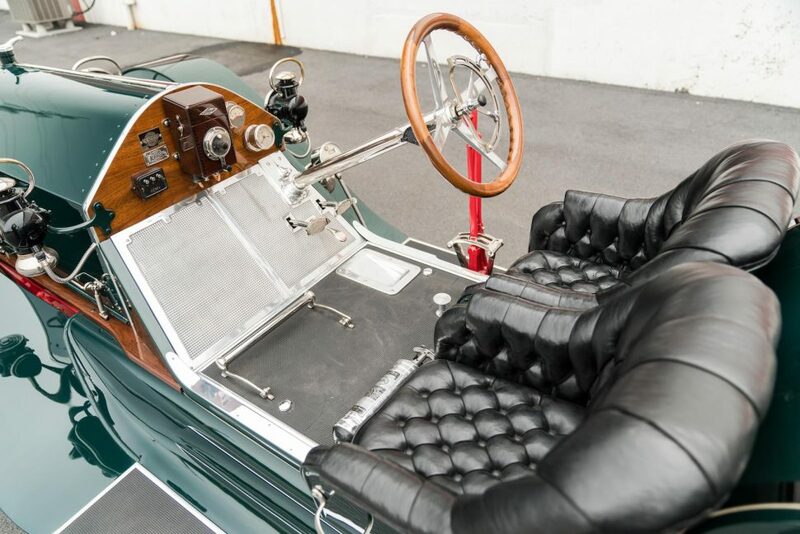 For more on the Philadelphia Simeone Foundation Automotive Museum sale, visit Bonhams.com. For further information on the Simeone Foundation Automobile Museum, visit SimeoneMuseum.org.